2014 "Los Angeles Times"’ High School Football Player of the Year. 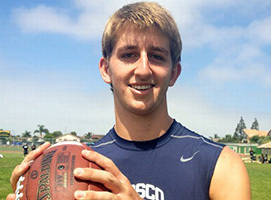 Josh has over a 4.0 grade point average and regarded as the top high school quarterback in the nation. He has been ranked as #1 overall high school player by one scout service. He signed a full scholarship contract with UCLA and enrolled in college early in January to compete for the starting job in fall 2015.